If you look closely you will see the third cub following mother along the shore of the Glendale River estuary. In the spring until August 25th we cruise along the shore of the Glendale estuary as well as up the river as the tide rises in search of grizzlies. It is always interesting to watch the mother walk into the water and swim for a short distance because the cubs will climb over almost anything on shore to avoid going into the water. They are good swimmers at this age but have not learned to enjoy the water however later in the season when they are chasing salmon in the river they seem more at home. 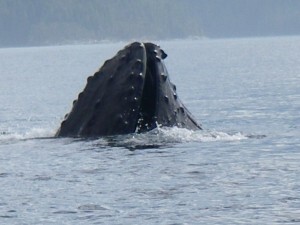 Whale watching tours from Grizzly Bear Lodge were fortunate to view many humpback whales this summer. Most trips encounter ten or twelve different whales and some days up to twenty whales. 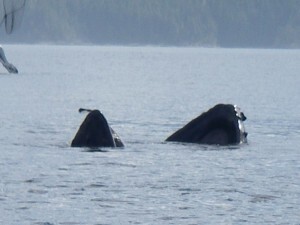 Most days we were able to watch them lunge feed on the schools of herring. These two photos show a whale coming straight up with mouth open, pausing for a few seconds before closing it’s mouth which was full of herring. Notice the back of the boat in the first photo that was a guided fishing charter out of Telegraph Cove on Vancouver Island.